We don't have any trips to Chile at the moment . The Republic of Chile is the longest country in the world located in the South-West of South America, with a length from North to South of 2653 miles. Its borders Peru in the North, Bolivia in the East and Argentina to the west and shares the same ocean as Antarctica in the South. Chile also has a number of islands including San Félix, San Ambrosio, the archipelago of Juan Fernandez, Sala and Gómez Island and Easter Island. Chile’s capital is Santiago with around 18 million inhabitants and it is proudly home to the most southerly town in the world, Puerto Williams. Chile is an authentic sanctuary of nature that delights us at all times with the spectacular natural landscapes. The country is 80% mountainous terrain and in its diverse geography, there are also valleys, glaciers, rivers, lakes, fjords, dunes, and volcanoes. Along the Andes mountain range, the Andean condor exhibits its majesty and famous flight, present in the shield of the country. Chile is the birthplace of poets including Gabriela Mistral and Pablo Neruda, awarded with the Nobel Prize for Literature. It is the most seismic country after Japan and the best place in the world to direct your eyes to the sky and unravel the mysteries of the universe. Passport required for length of stay with one blank passport page. No visa is required for stays up to 90 days. There are no mandatory vaccinations for travelers coming from the U.S. 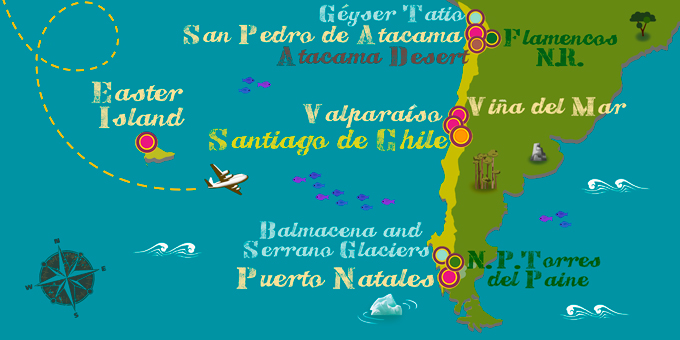 If Chile has caught your attention, leave us your number so we can call you to discuss the voyage that awaits you.